Turn bedtime into an aeronautical adventure with this whimsical bedding set. What do Buzz Aldrin, Buzz Lightyear, and your little one have in common? A serious affinity for the cosmos. Help them suit up in proper aeronautical gear with this bedding set by Peggy van Leer and Erik van Loo. 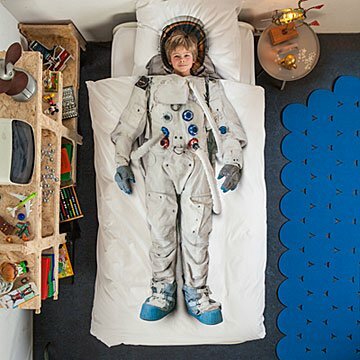 Featuring a high quality print of an astronaut on both the duvet and pillowcase, you'll help turn bedtime into a moonwalking adventure they'll look forward to night after night. Designed in the Netherlands. Made in Portugal.